Thanks to our friends at Allied Integrated Marketing we were able to take part in and review the Oct 8th, FirstMan VIP Pre-Screening at Atlanta’s Regal Atlantic Station. This event included a post-screening Q&A with none other than the film’s director, Damien Chazelle and star, Ryan Gosling. Yes- You read that correctly – RYAN GOSLING!!! Our AMT Insiders were able to capture the live Q&A and have included a link here for your viewing pleasure (disregard our iPhone quality). We loved the fact that a NASA official was the moderator! Describing the moon landing, Damien spills that the dirty secret is that “space” is actually in Atlanta at Tyler Perry Studios, one of the first films to shoot there while they were still constructing the soundstages, and the moon at a nearby quarry. They didn’t want to use a lot of green screens or digital effects so they needed a big open space to recreate the epic scenes and make it feel more like a documentary. They even got to deal with Atlanta’s epic snow/ice storms but took it in stride. Big shoutout by Damien to the Atlanta film crew! Thanks, man! Regal is offering 14,000 free tickets for military personnel for the first screenings on Thursday evening, October 11th! Click image for participating theatres near you. #GeorgiaFilm’d First Man takes viewers on a riveting ride allowing you to experience the impossible journey to the moon. One small step for man, One Giant Leap for GEORGIA FILM thanks to Oscar®-winning director Damien Chazelle, who claims Georgia as his favorite place to film, not only for the location but the crafted GA Entertainment workforce that comes with it. Star Ryan Gosling’s portrayal of Neil Armstrong paired with Chazelle’s storytelling in #FirstMan sheds all new aspects of not only Armstrong’s journey to the moon but his journey through life. Viewers are left with a heavy heart and new respect for Armstrong the man versus Armstrong the astronaut we read about in high school. Universal Pictures + Chazelle curated this film for IMAX making viewers feel as if they’re Armstrong, commanding spaceflight Apollo 11. From a turbulent take-off as you bounce off the Earth’s atmosphere from 140,000 feet to firey landings, feat, and failures…This film will take you to THE MOON AND BACK- literally! 10, 9, 8, 7… First Man, set to release Oct 12th, is sure to be the next box office hit with several award nominations to follow…Roger that! So grab your tickets and get to theatres for a cinematic coaster to space! 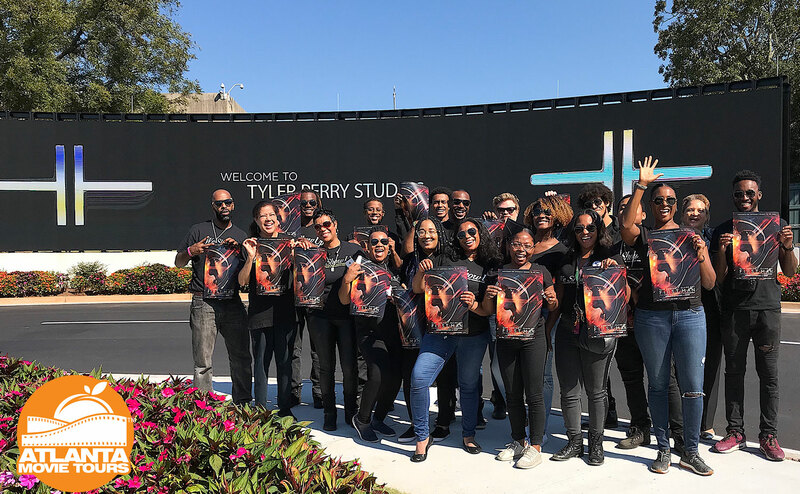 Check out this fun swag we had for tour guests, including a quick stop at Tyler Perry’s new studio at Fort McPherson to check out that video wall! Want to Get in & Geek out with us at future screenings and promotional tours?! Then be sure to follow us on all social platforms, @atlmovietours and subscribe to our Wednesday Weekly Newsletter for the latest on all things #GeorgiaFilm. We will also be working on adding First Man locations to our Best of Atlanta Film Tour so make sure to climb aboard for the fun!